I am a nearly 34 year-old woman with the finely developed humor sensibilities of a 13 year-old boy. Give me your bodily function jokes, your politically incorrect puns and a dash of gallows guffaw and I am a happy camper. Throughout the years I have counted such animated television programs as Beavis and Butthead, South Park, the Family Guy and the Boondocks among my many favorites. But it must be pointed out, I come for the sight gags and stay for the often prescient social and political commentary that these programs offer the already warped mind. So when I first learned a of a new film directed, co-written and produced by Family Guy creator Seth MacFarlane, I was intrigued. When I intimated that said film involved a 35 year-old man (played by the always delicious Mark Wahlberg) and the complex adult relationship between he and his childhood teddy bear, my interest grew. 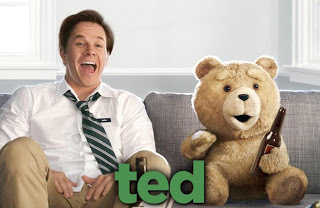 Then I heard that the titular bear, Ted, was a foul-mouthed, over-sexed, drug abusing stuffed animal come to life and I was counting the minutes until the film’s release. The movie did not disappoint in its promise to offer something new yet familiar: a stream of poop and fart jokes, Wahlberg’s handsome face and Mila Kunis’ winsome screen charm. But the film offered something else too for those willing to look past the veneer of R-rated hilarity. Part of the movie’s message served to underscore a point I have been arguing off and on for several years, a pitfall to which I know I am not immune: the members of Generation Y are having an awfully tough time growing up. If we accept this explication of terms, this puts yours truly right smack at the beginning of this demographic. It is also worth noting that the bulk of Gen Y’s members are the progeny of late-era Baby Boomers, a state of affairs which cannot fail to offer a relationship between the sense of entitlement that myself and my fellow Gen Yers often display. We were raised by our credit-relying helicopter parents (generalizing) to believe we had certain inalienable rights: the right to be special, the right to be happy, the right to warrant media attention and most especially the right to abdicate from situations that are not to our liking. Toughing it out stoically doesn’t appear to be part of our vocabulary. And so it is in Ted. The main character, Johnny, is introduced to audiences as a lonely little boy in the 1980s. Growing up in Boston as the only child of doting parents, his is a case of wish-fulfillment gone awry. He and his parents spend so much time pretending that the teddy bear is the weird kid’s real pal that when the fantasy becomes reality, there’s no eventual lesson about Johnny trying to improve his relationships with humans – just relief that they don’t have to worry about him talking to himself anymore. Cut to the present-day where Johnny is drinking and pulling bongs on the couch with a now 27 year-old Ted on a daily basis. The man-child is underemployed by a rental car agency while his more stable girlfriend (Kunis) holds down an adult gig and pays most of the rent on their gorgeous brownstone (presumably – I know what it costs to live in Boston). That the movie has several different happy endings is more than just onscreen fiction. I have plenty of contemporaries who just never emerge from this pattern of underachieving, and they certainly don’t do so with six pack abs. Ted is more than a comic film. It’s a cautionary tale with a message that could be easy to miss underneath the shock humor. 35 year-olds, by and large, are still babies. I’m going to go do a tequila shot, cuddle my Cabbage Patch Doll and think more about it.